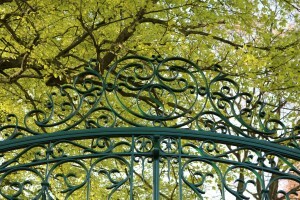 Gateway to the Chateau D’Oiron…final installation! 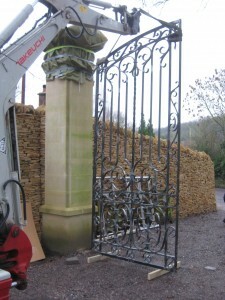 Over the last few months we’ve been blogging about the 16th Century gates we were commissioned to make for a Wiltshire residence. 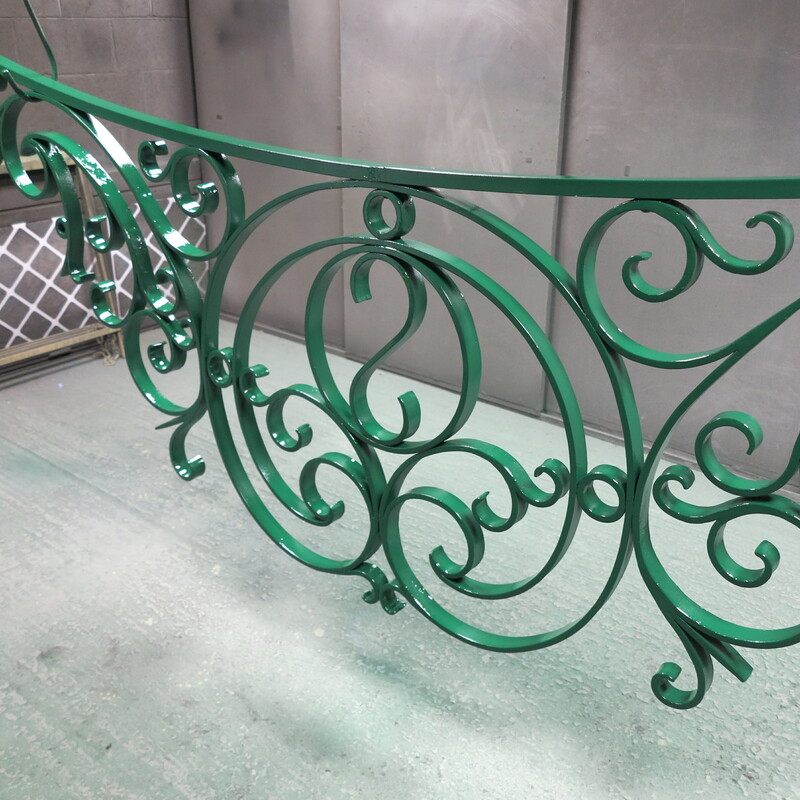 Now into the final stages, the gates and overthrow have been beautifully brought to life in a mid Brunswick green and are looking pretty impressive! Due to their size, the gates themselves were painted at the Somerset Lavender Farm in Faulkland – thank you to Judith and Francis for allowing us the use of their barn to do this! 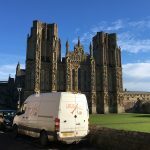 Final fit was then scheduled for the end of March – a pretty momentous time for the team involved! 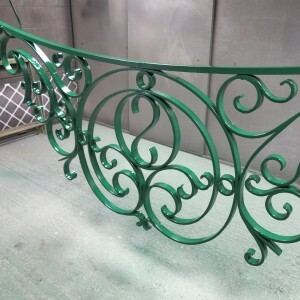 Over a tonne of traditionally crafted, beautifully ornate mild steel was now ready for installation. 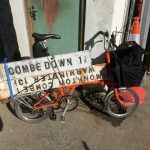 Transported to Wiltshire by trailer, the team – along the gates and overthrow- undertook the final installation very much along the lines of the trial fit back a few months earlier. 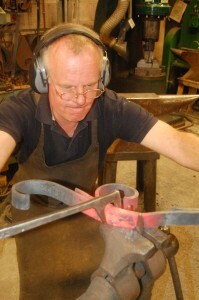 Larger scale lifting machinery was needed this time and the fit itself went very smoothly, the trial fit having helped smooth out any potential problems. 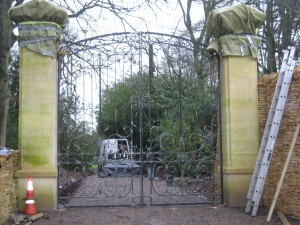 Installation took the full day and once in, the client as well as interested local residents were highly impressed! 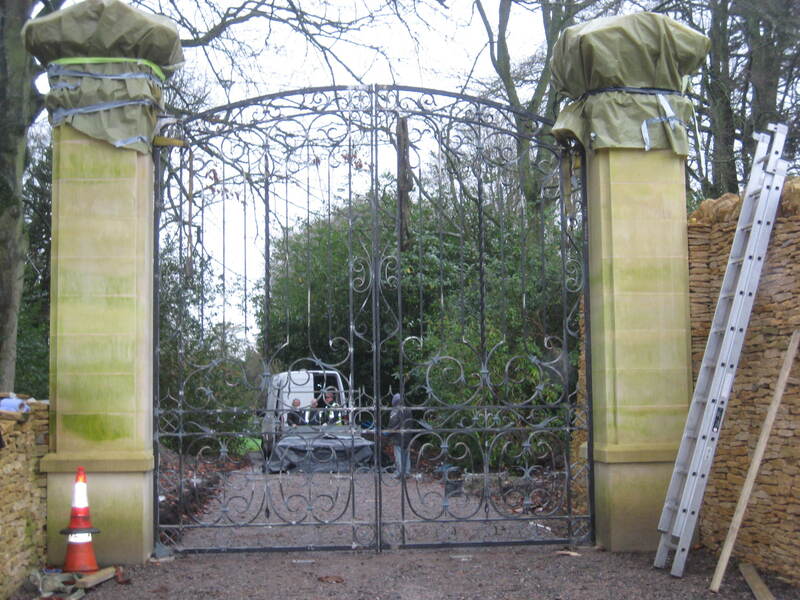 The gates looked wonderful in their setting, perfectly in proportion to the surrounding stonework of the property. 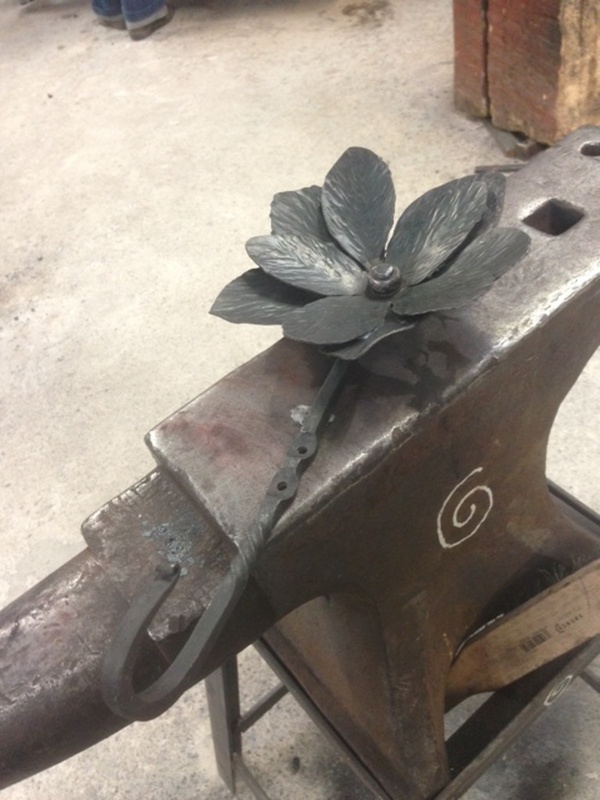 A brilliant commission and a beautiful job well done! 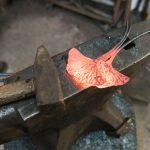 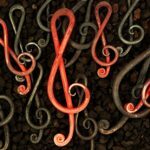 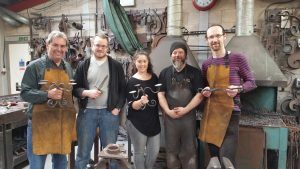 Here at Ironart we are very fortunate to see and be involved in some amazing commissions, but once in a while the opportunity to be part of something very special comes our way. 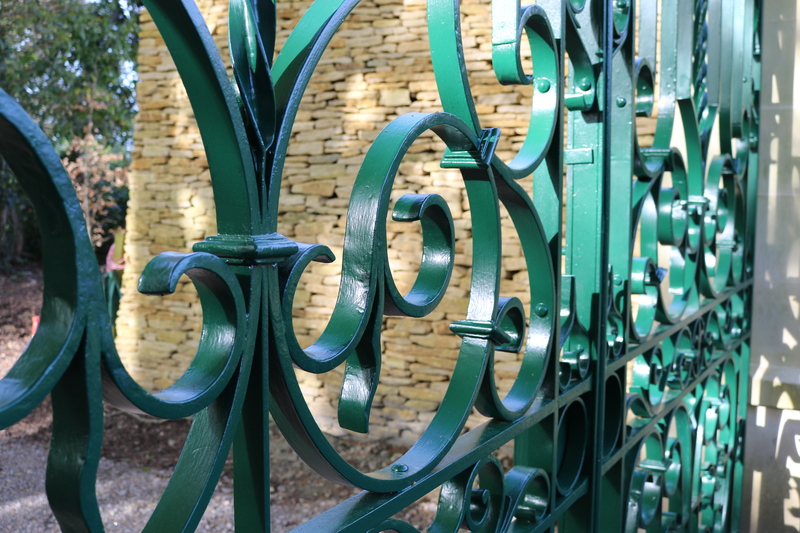 Earlier this year we were asked if we could produce a pair of traditionally made gates for a private Wiltshire residence. 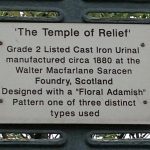 Why so special? 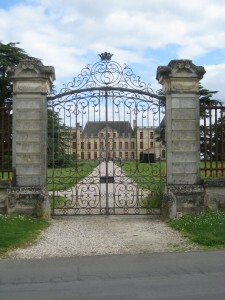 Because these were to be an exact replica of the main gates to the 16th Century Chateau D’Oiron located in Oiron, in the Deux-Sèvres department of Western France –the backdrop for Charles Perrault‘s fairy tale, Puss in Boots. 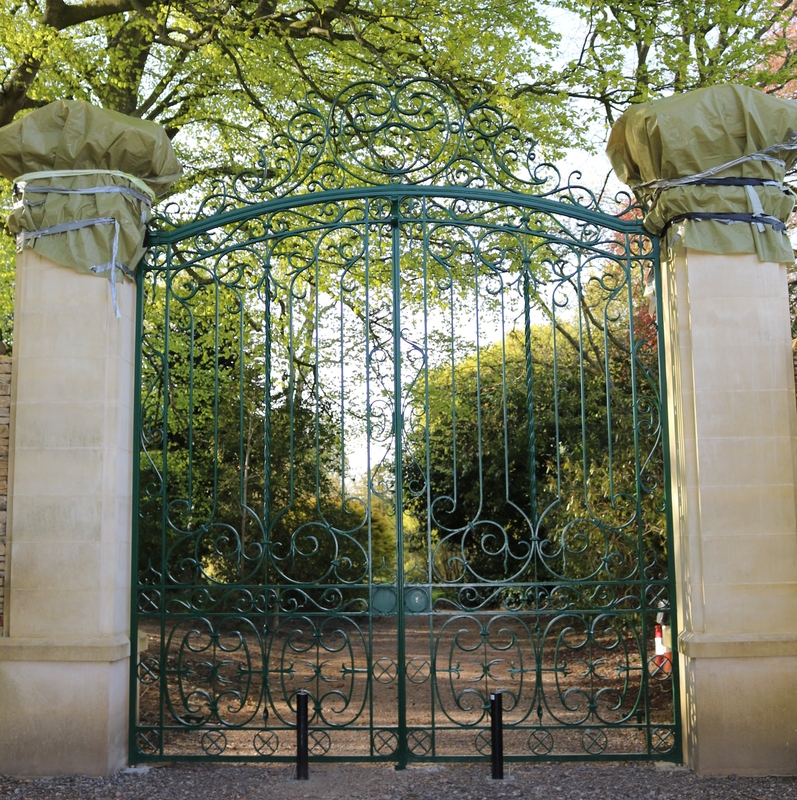 Beautifully crafted, highly ornate and standing 4-metres tall, with a 4-metre opening, the gates have been and continue to be (quite literally!) 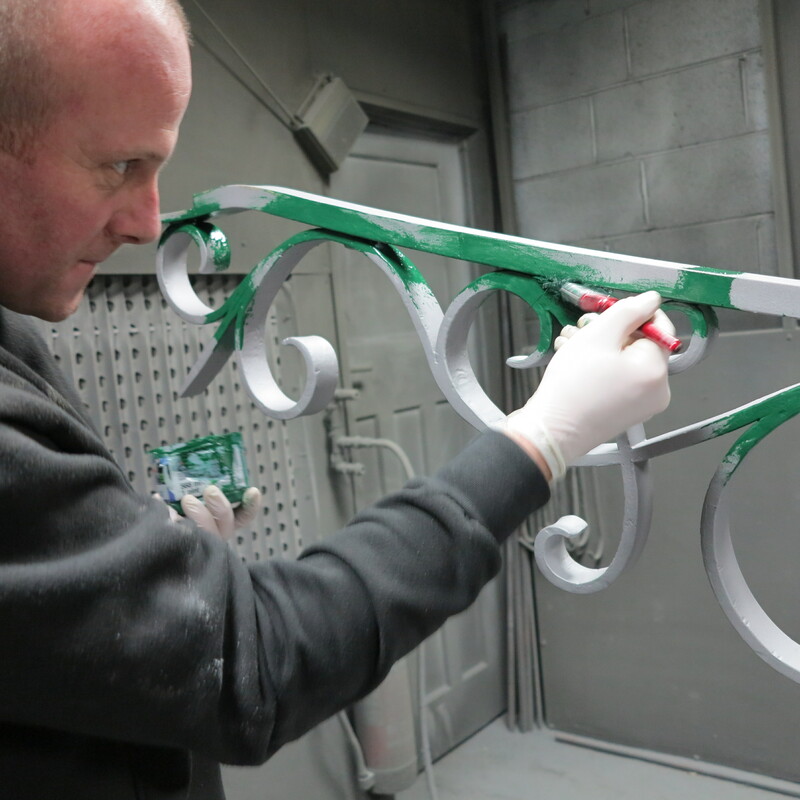 a big feature in the workshop, with Jason and the team working hard to ensure that every detail and specific original features of the gates are spot on. 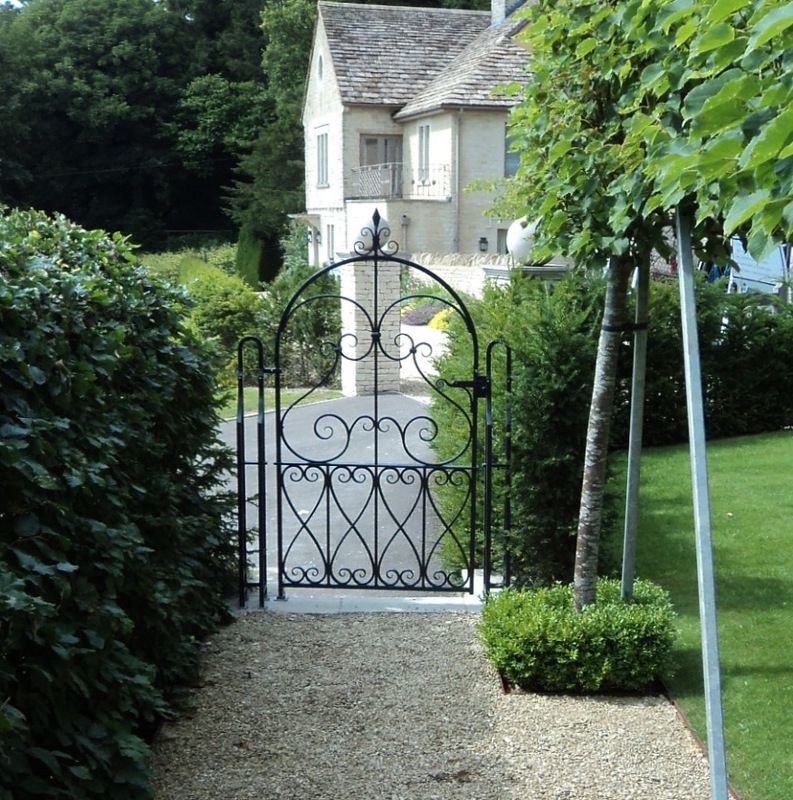 The gates are forged in very heavy mild steel sections consisting of 45mm² hinge stiles, 45mm² top and bottom rails, all with upset ends and forged tenons. 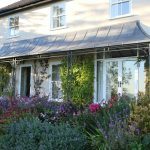 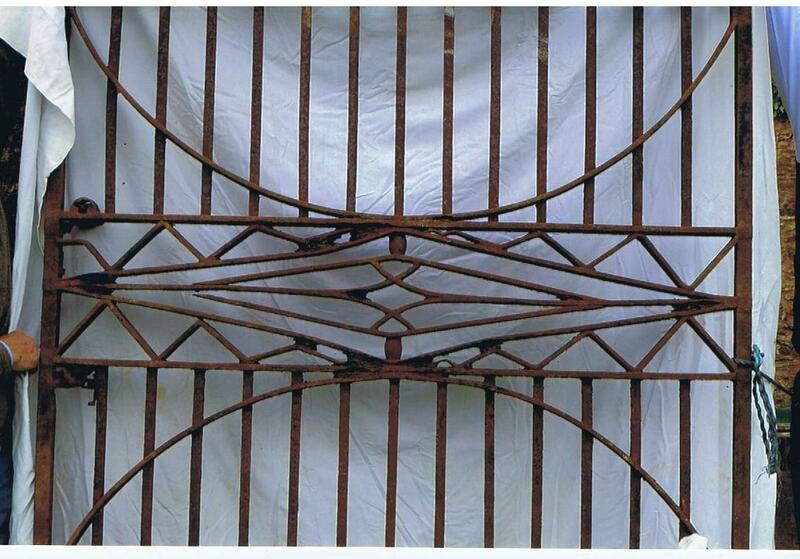 Incorporating numerous horizontal rails of 45x20mm – also with forged tenons – the gates feature numerous scrolled sections made from 40x15mm and 40x12mm flatbars, all forge-welded and formed hot. 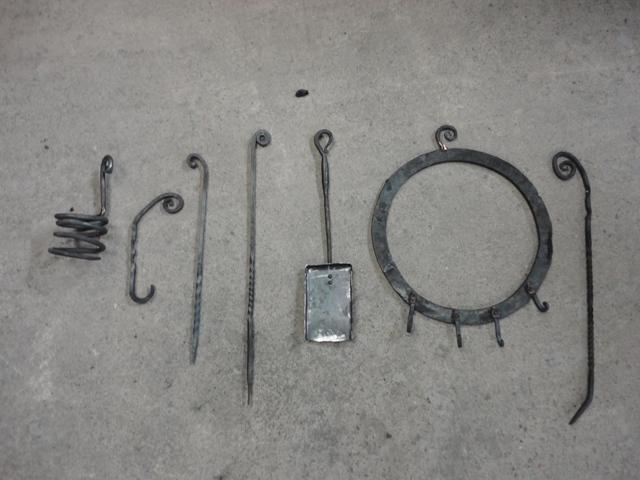 With all the component parts made and assembled, work continues apace! 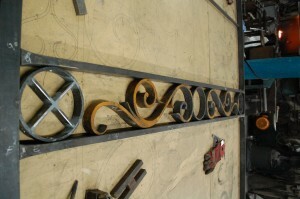 Here are a just a few photos of the gates in the workshop from the very early stages. 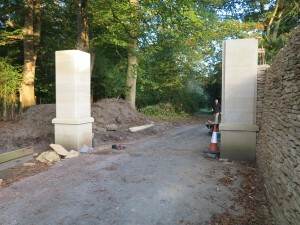 We’ll keep you posted with progress and pictures over the coming weeks. 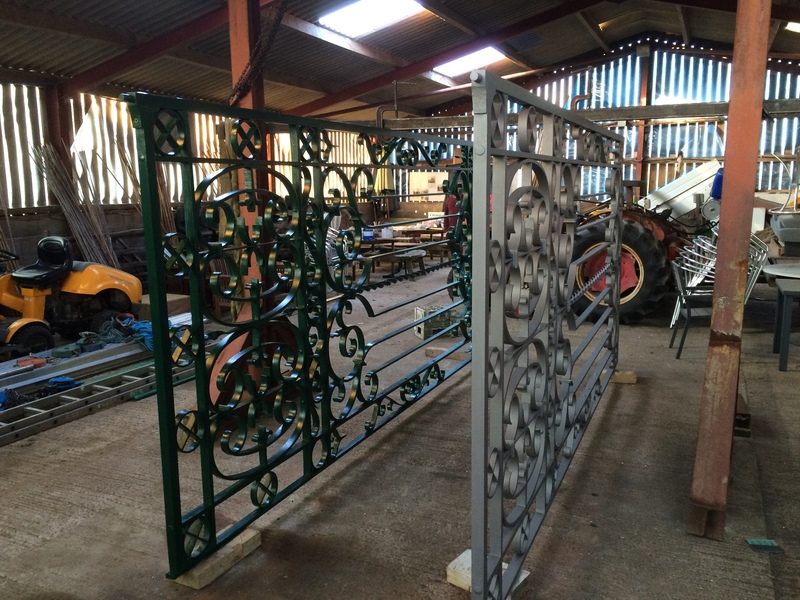 During January Martin Smith and Paul Ashmore worked on the restoration of an unusual kitchen garden gate from Cothelstone in the foothills of the Quantocks. 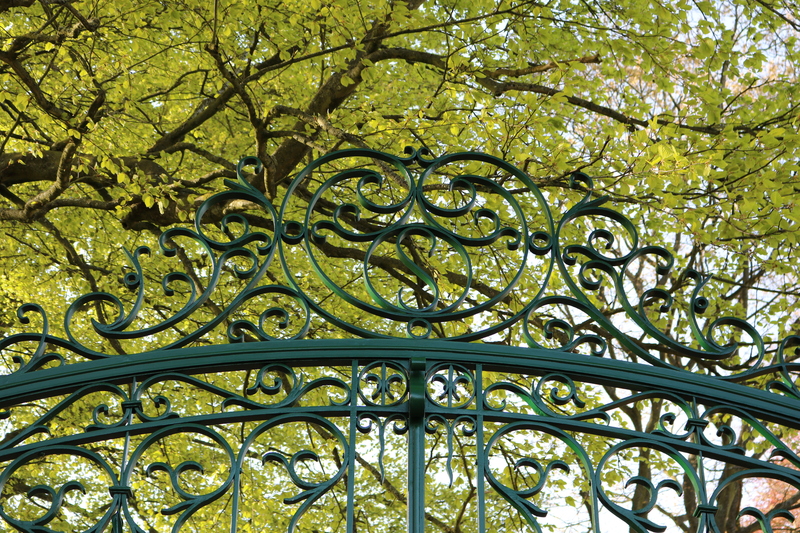 The Ironart team was also commissioned to follow the original design and make up three new, replica gates to replace those that have long since gone missing from the walled garden, a challenge which we gratefully accepted. 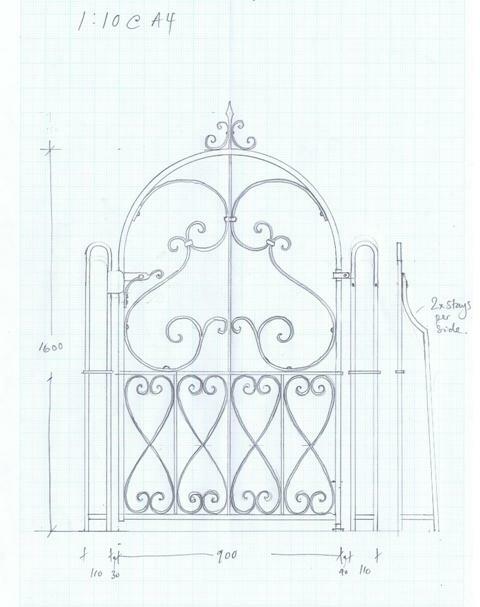 The original gate is an impressive, heavy wrought iron example of complex, traditional construction, featuring tenon joints and curved punched rails and elegant forging. 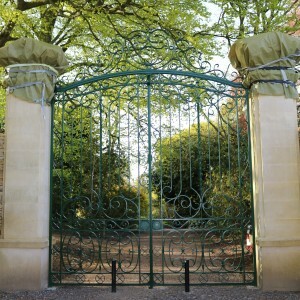 By Martin’s estimation the gate dates from c. 1820 and was without doubt specifically commissioned for the walled kitchen garden it graces. 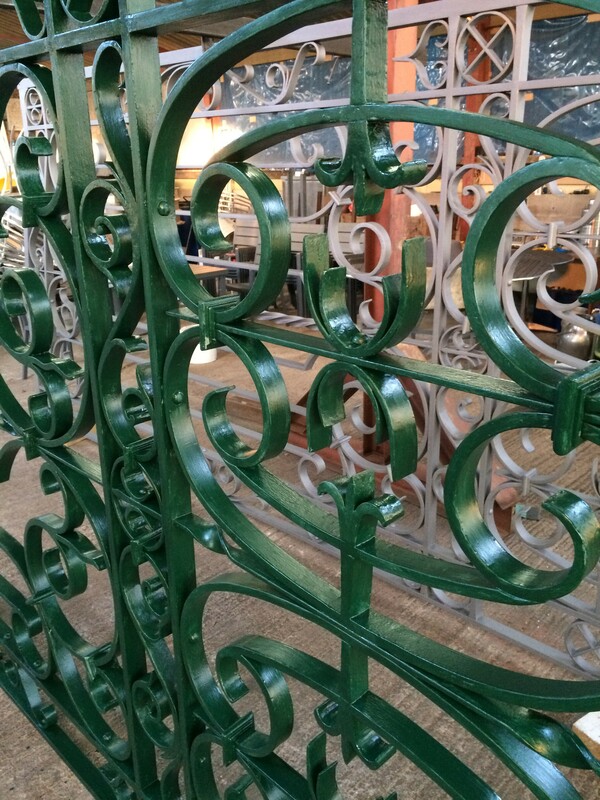 This was a really interesting and challenging project for the Ironart team who fully appreciated the craftsmanship and high level of precision with which it had been made. 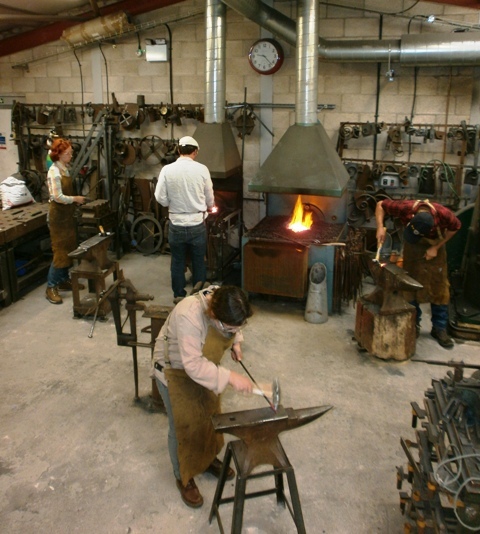 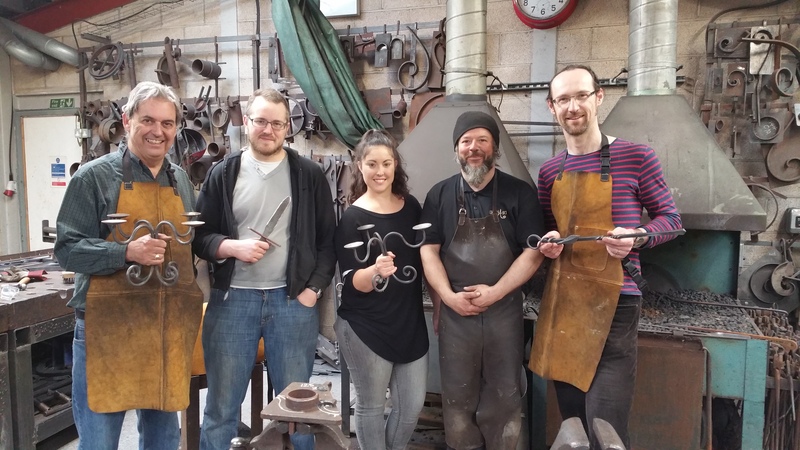 The replica gates were tackled by one of our highly experienced blacksmith’s Jason Balchin, understudied by NADFAS intern Cecilie Robinson and Adrian Booth. 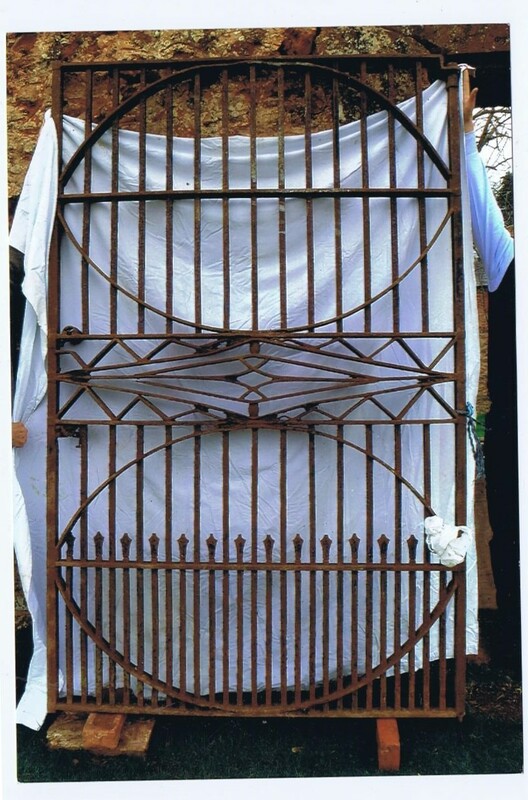 Jason’s first challenge was to scale down the dimensions of the original gate and create templates for the three new gates to fill the apertures in the wall. 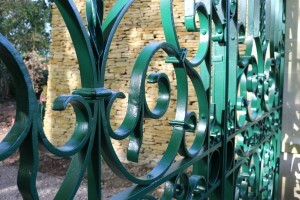 The new gates not only faithfully followed the design of the original, but were also traditionally made, with tenons, mechanical joints and firewelded features. The central diamond detail was made up of fire-welded joints and halving joins. 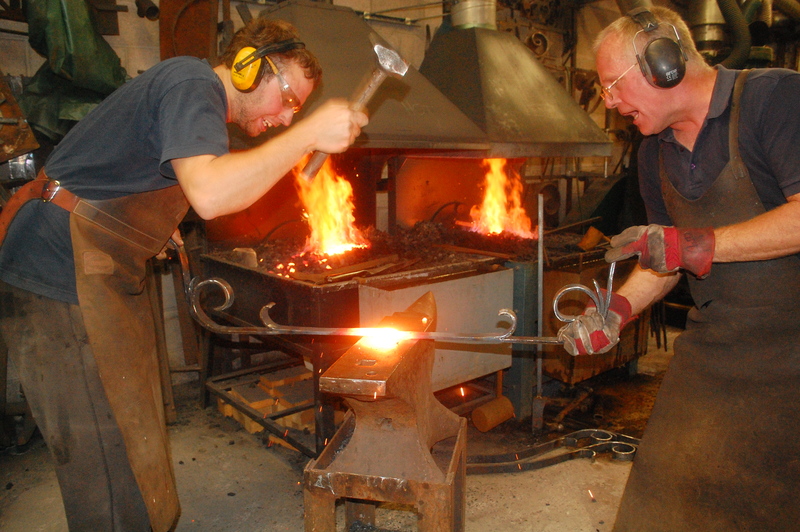 All the ends of the rails had forged tenons which were heated up and riveted into countersunk holes on the stiles. 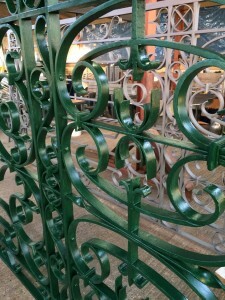 It’s important to point out that these new gates were constructed using modern materials – ie: metric mild steel instead of imperial wrought iron. 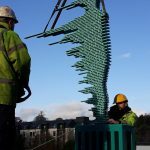 Due to the complexity of this project the team had to assemble them three times during the making process to ensure that all dimensions and calculations had been accurately achieved. Prior to assembly all the mating joints and tenons were flooded with a zinc rich primer before being sent to a local firm for shot blasting and hot zinc spraying and priming. 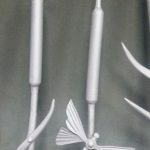 Once this has been done they’ll be ready for their final paint application.